Just because your workforce is scattered doesn't mean your organization has to be. Most workplace intranet software solutions are either too static or too complex for your employees. Your school based learning management system (LMS) is doing more harm than good to your business. We get it. And that’s why we created Sparkwork. Because your business is different. Bring all your team in multiple locations together. Facilitate the shared understanding of goals, work and increase productivity. Sparkwork’s searchable knowledge hub makes finding files, content and people as easy as pushing a button. Get the information you need, from wherever you are. Sparkwork mobile has been created to empower those that do not have a desk or a laptop. Sparkwork increases the employee engagement across the entire organization, from frontline staff, field workers, remote users and external workers; improving their know-how, performance, productivity and loyalty. Sparkwork empowers employees to feel more connected and engaged with your brand. Coupled with Sparkwork’s automation tools this means for managers being able to focus more on efficiency and less on admin. Sparkwork is a true enterprise software – fast, secure and configurable to match your needs. Sparkwork serves everyone from ten-person companies to tens of thousands of daily users. Sparkwork’s versatile user and group management, advanced content management and powerful reporting give managers the ability to keep track of activities and progress. Easy to understand dashboards give insight into engagement, helping organizations continuously improve their employee experience. At Hog Island Oyster Co. we see engaging our staff as the first step toward creating a great culture and an incredible experience for our guest, we choose Sparkwork because of the way it supported our connection to our staff in all the different location throughout the entire company and made it fun for them to be a part of a team! Director of Restaurant Operations, Hog Island Oyster Co.
Sparkwork is used by our 600 convenience stores across Finland for informing, training and engaging our workforce. The gamification tools offered by Sparkwork helped us to instill a winning culture among our frontline employees. 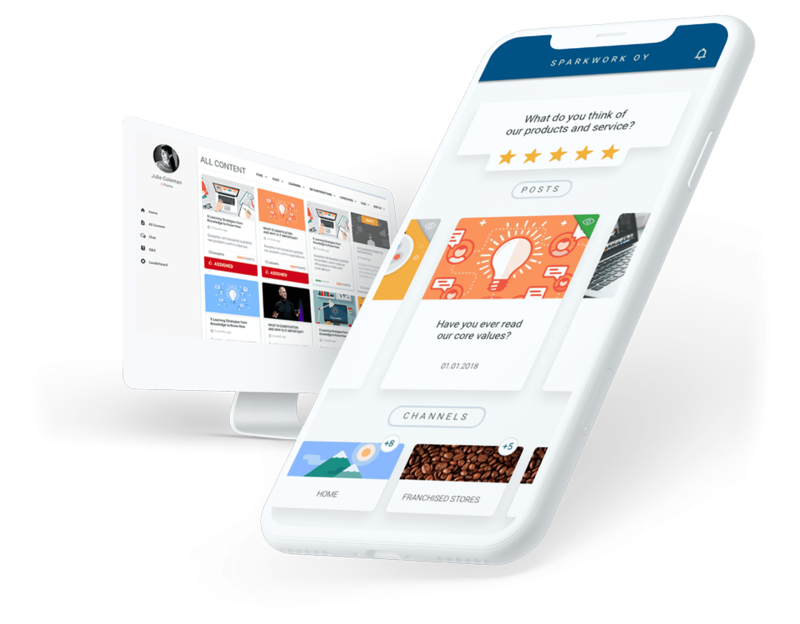 The old intranet tool was not meeting Fysios’ requirements and it was too static, we needed a system that would actually work and engage the users. Content creation and sharing is super-easy in Sparkwork. We use Sparkwork not only as an alternative to our old intranet but also in online learning, information sharing and as a quality management system. We were looking for a modern system that would be easy and flexible for both the content creators and the end users. Sparkwork came out as a clear winner! Want to see Sparkwork in action? See it for yourself how we can help your organization to boost employee experience (EX), improve organizational communication and know-how, make your employees more productive and engaged.